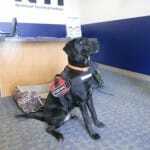 PORTLAND, Maine (NEWS CENTER) — Service dogs play an important role in helping people with different disabilities. They help many live more independently and can help them deal with certain medical conditions. These specially trained canines are also assisting veterans who suffer from Post Traumatic Stress Disorder or PTSD. PTSD is a condition which affects an estimated 30% of our country’s war veterans. A Maine based organization which supports veterans with PTSD is helping train these four-legged friends to help veterans overcome one of their toughest battles – readjusting to civilian life. Meet Gunner! Gunner comes to school with a student a few times a week. He is such a good boy and very well-liked by Staff and Students. 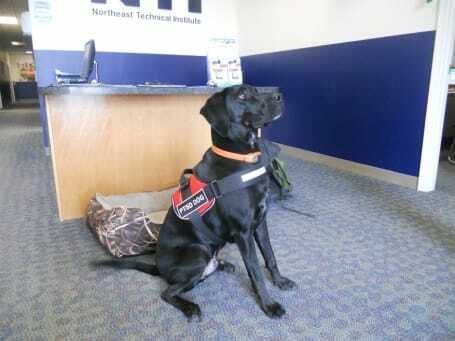 Welcome to NTI, Gunner! Rich Brewer served in the marines in the 1980’s, stationed at embassies all over the world, including war-torn Lebanon. But serving his country didn’t come without a price. After returning home he suffered nightmares, flashbacks and considered suicide to deal with the panic attacks. It took almost 20 years before he was diagnosed with PTSD. But everything changed when he received his adorable four-legged friend. Anka’s unconditional love and companionship has provided healing he didn’t think was possible. Brewer started One Warrior Won several years ago, a national organization that provides education and other resources for veterans and their families about PTSD and traumatic brain injuries, known as TBI’s. © 2019 Northeast Technical Institute. All Rights Reserved.